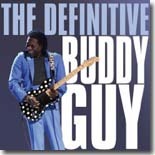 The Definitive Buddy Guy (Shout! Factory), a 17-song collection, assembles many of the staples from the Buddy Guy book -- which is to say, no surprises here -- just killer tune after killer tune. It’s a formula that’s worked before. Seven of the selections appeared previously on the Buddy Guy Collection, released in 1992 on Rhino. The folks who brought you Rhino lo those many years before are the same who launched Shout! Factory shortly after selling Rhino off. Apparently, they’re Buddy Guy fans. What’s not to like? He’s that perfect combination of inventiveness, extraordinarily precise and soulful guitar playing, and a truly fantastic voice. “Sit and Cry (The Blues),” “First Time I Met the Blues,” “Ten Years Ago,” ”Stone Crazy,” “Five Long Years,” “A Man of Many Words,” and “She Suits Me To a ‘T’” are classic Buddy Guy. They’re also the seven tunes that were on the earlier collection. The Definitive Buddy Guy makes a first-rate intro to Buddy Guy for those new to his magic, and satisfies those of us who have been digging him for decades. Very cool.